Emily Atack will now play the role of Holly Golightly in the UK Tour of Breakfast at Tiffany’s from 2 May to 11 June 2016, appearing at His Majesty’s Aberdeen, Nottingham Theatre Royal, Theatre Royal Bath, Glasgow Theatre Royal, King’s Theatre Edinburgh and Wycombe Swan. She will be replacing Verity Rushworth, who has had to withdraw because she is expecting her first child. Emily will be sharing the role with Pixie Lott, whose dates, including the West End season, have been announced previously. 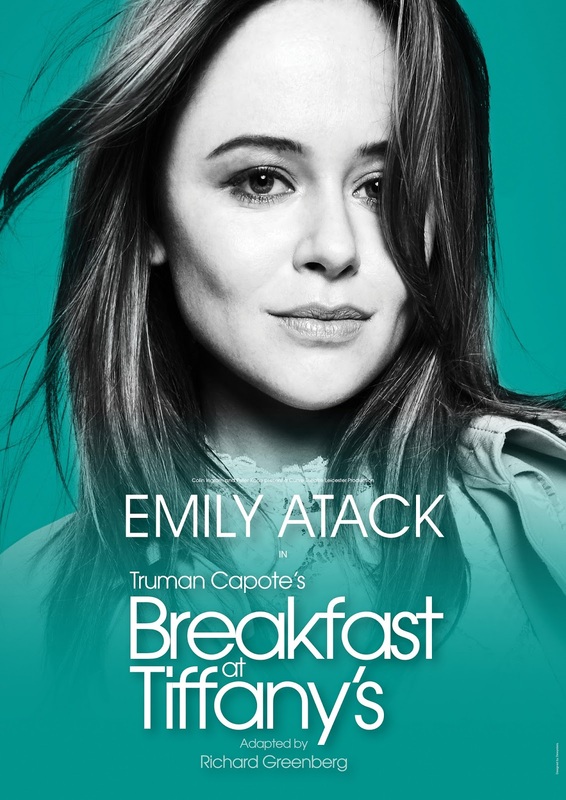 Director of Breakfast at Tiffany’s, Nikolai Foster, said of the casting of Emily Atack, "I am delighted Emily is joining Pixie Lott to share the role of Holly Golightly in our production of Breakfast at Tiffany's. It's a thrilling prospect for all of us to be working with actors who are perfectly suited to the role and will encourage a new generation of theatregoers to share Capote's beautiful story. We cannot be sad to be losing Verity as it is for such a happy reason and we all wish her well with her pregnancy." Also in the cast of Breakfast at Tiffany’s are Matt Barber (Atticus Aldridge in Downton Abbey) as Fred, Victor McGuire (the sit-coms Trolliedand Bread) as Joe Bell, Robert Calvert as Doc, Naomi Cranston as Mag, Charlie De Melo as José, Tim Frances as Rusty Trawler/Editor at21, Andrew Joshi as Yunioshi, Melanie La Barrie as Mme Spanella, and Sevan Stephan as OJ Berman/Dr Goldman, with Katy Allen and Andy Watkins. Breakfast at Tiffany’s is directed by Nikolai Foster, the Artistic Director of Curve, with production design by Matthew Wright, lighting design by Ben Cracknell and sound design by Mic Pool. Breakfast at Tiffany’s began its run of sold-out performances at Curve, Leicester on 3 March, before embarking on a UK & Ireland Tour on 15 March. There will be a 12-week season at the Theatre Royal Haymarket in London’s West End from 30 June to 17 September 2016. Breakfast at Tiffany’s is a co-production between Colin Ingram, Curve, Peter Kane, William Sinclair and Michael Melnick & Finlay Gray.